I’d be lying if I said the 47 executions of what Saudi Arabia referred to as Shiite terrorists upset me, but when there are high-profile people in the world that go nuts when Israel takes out terrorists soon after they murder Israeli citizens, I can’t help but ask that same boring old question. Where’s the outcry? Truth be told, if these 47 are actually terrorists, there should be no outcry. However, seeing how that doesn’t stop a Roger Waters or the United Nations from flexing their anti-Semitic muscles when Israel takes action the obvious question is, why is this not worthy of their protest? It comes down to 2 things. The first thing is money. The Saudi government doesn’t get away with what it does because it’s run by a bunch of charming politicians, it gets away with what it does because it has gross amounts of money. More than it can ever spend. This kind of money yields great power. Whether individuals who attack Israel, possibly even by proxy, do so because of direct financial gain or not, the Saudi money certainly has the power to pull their strings and keep people quiet when it suits them, which they undoubtedly do. The second thing it is based on is the hatred of the Jewish people. It’s not the act that bothers some people, it’s the fact that the Jews dare to defend themselves. Think of it logically. If you have someone who always speaks out against war and killing and the tragic deaths of innocent people then you can certainly make the case that you are dealing with individuals who have concern for humankind. But when it’s OK for Saudis to execute 47 prisoners but not OK for Israel to target and kill 2 or 3 terrorists who recently murdered women and children, there is no getting around the double standard. 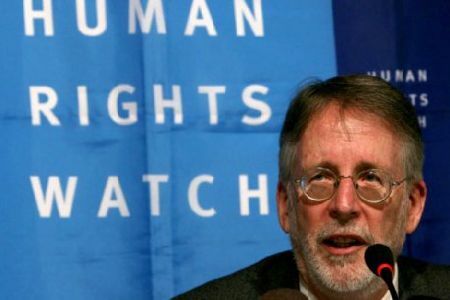 As much as I have been at odd with Kenneth Ross, the Executive Director of Human Rights Watch for his attacks on Israel, if I am to be fair and consistent in this piece I must give him his props. When looking at his Twitter page he attacks these killings with vigor and goes after many he sees as committing acts that infringe on the rights of others. I may see Israel’s acts as being necessary for its safety and existence, but I am far more willing to accept criticism from someone who gives equal time to all acts they see as unjust, not just acts committed by the Jewish state. I still don’t accept the notion that we can compare what Israel does to what a nation like Saudi Arabia does, but my battle won’t be against those who call out everyone including Israel, it will be against those that call out no one but Israel. The difference is not subtle at all. The difference is blatant and obvious. One person wants peace, the other wants weak, powerless, or even dead Jews. I’m happy to have a spirited discussion with those who want peace for everyone, even if I feel they are missing key points, because at least I can hope that they put a value on Jewish life as well. But to those who only see the wrong in what Israel does, know that not only do you not help the fight against terror, you hurt it, and you too have blood on your hands.